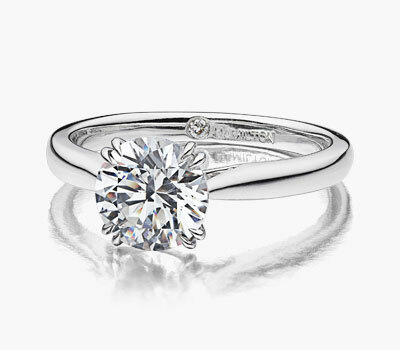 Named for our 100th anniversary in 2012, the Hamilton Centennial Solitaire is a timeless design of simple elegance. Sometimes, the classics are best and this is a perfect example of modern sophistication. Expertly crafted in 18k gold or platinum with a sculpted, tapered band, handmade setting and split prong detail to perfectly cradle your diamond of any shape. Our signature diamond is set inside the band.